CHRIS A. BOLTON has written short fiction, stage plays, sketch comedy, and screenplays. He wrote and directed a web-series called Wage Slaves and had his first professional short story published in Portland Noir (Akashic Press, 2009). 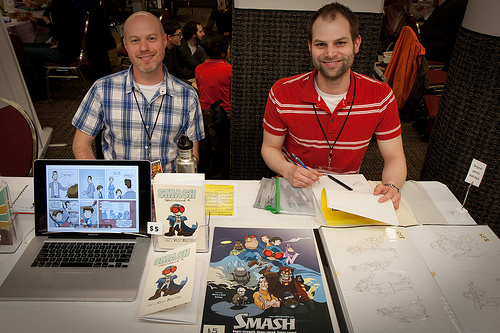 He wrote the graphic novel SMASH: TRIAL BY FIRE (Candlewick Press, 2013) and is currently writing the second SMASH book. He lives in Portland, Oregon. KYLE BOLTON has been drawing since the age of four, although SMASH is his first professional comic work. A graduate of the Art Institute of Seattle, he has worked for a variety of game companies creating 2D and 3D animations. Kyle is a true Seattleite, whose daily activities include a trip to the dog park powered by coffee and imagination. Kyle currently draws and lives in West Seattle with his wife, Jamie, and dog, Zeus. For more of his work, visit kylebolton.com.